Quahogs, also known as hard clams, are popular throughout their range. Two species of hard clams are found along the Atlantic Coast of North America, from Canada to Florida. The quahog clam is the official shellfish of Rhode Island. Catching quahog clams is a popular recreational activity along much of the Atlantic Coast. Working mostly during a low tide, clammers harvest quahogs using clam rakes, by sight (signing), or simply by wading in the shallows and feeling clams with their feet. Seafood markets classify hard clams corresponding to their different sizes. The smallest clams are called littlenecks. Topnecks and cherrystone clams are larger sizes. The largest clams are called quahogs or chowder clams. Littlenecks and topnecks are served steamed. 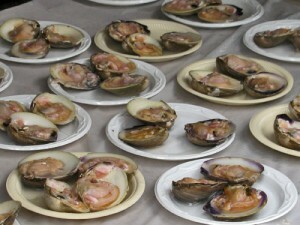 Cherrystone clams are served raw on a half-shell, with cocktail sauce or lemon slices, or used for clams casino. Large quahogs are chopped and used for clam chowder, clam fritters, and other dishes.